Is This the Best Stock in the Market Today? Let's face it, as the market continues to plod higher, it's getting tougher to find interesting stocks to buy. Way too many stocks in the market today are priced at a premium with years of future growth priced in. That's why I've been looking at companies that haven't risen lock-step with the market. One name that caught my attention is PotashCorp . Our CAPS community has awarded the company the treasured five-star rating, with 4,768 bulls far outnumbering just 169 bears. I must admit, I was an early CAPS bull; unfortunately, that hasn't served me well as PotashCorp has underperformed the market by 58% since I gave it the green thumbs-up. That being said, this relative underperformance could mean that there's a lot of room for the stock to move higher. Let's take a look at three keys to success that just might make it the best stock to buy in the market today. 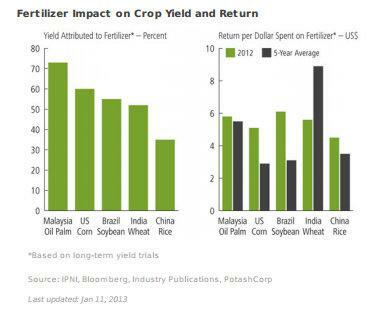 The investment thesis for PotashCorp is really simple: The world needs to produce more food from less arable land, which means that fertilizer will be a key ingredient in making that happen. With its focus on potash -- it has 20% of global capacity, which is more than any other company -- PotashCorp is in a great position to meet this need. The company rounds out its global crop nutrient portfolio with 2% of global nitrogen capacity and 5% of phosphate capacity, both of which have the company in the third-ranked position on the global scale. These trends also bode well for is competitors; however, not all will benefit to the same degree. Because of its scale, PotashCorp is the low-cost producer of potash. That provides the company with a margin advantage that's not seen in its peers. Agrium for example is pursuing a more integrated strategy which includes a vast retail operation. Those retail operations, while important and profitable do affect margins, though margins have vastly improved over the years. Finally, when you look at nitrogen, PotashCorp is not as exposed as CF Industries or Terra Nitrogen . While low natural gas prices are currently driving profits at those two companies, such commodity exposure is an area to watch. 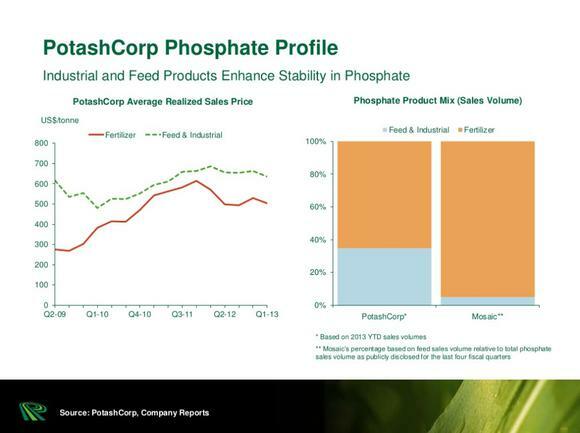 For PotashCorp, it's much more focused on its low-cost, potash production, which should produce solid long-term profits. The last item to consider when thinking about PotashCorp as one of the best stocks on the market is its yield. Not only is the world starved for food and seeking its yield-producing products, but investors are just starving for income yield these days. PotashCorp delivers here, too, as its stock currently yields 3.2%, reflecting a recent 25% increase. Over the past few years the company has raised its dividend in excess of 700%, an important consideration for income-seeking investors. The bottom line is that if you're looking for yield then look no further than PotashCorp. For a long-term investment, there's a lot to like in PotashCorp. Is it the best stock in the market today? I'd be willing to bet that you'd get a different opinion from every other investor you ask. That being said, with most stocks in the market today vastly outperforming PotashCorp over the past few years it now might be its turn to perform. Given the three drivers I mentioned, that future is looking like a distinct possibility. Further, as the global leader in potash production, PotashCorp has established several barriers to entry that make it nearly impossible for competition to break through. If you'd like to dig a little deeper into the company simply click here now to access The Motley Fool's premium research report that covers precisely what these barriers to entry are and details several other key reasons why PotashCorp presents such a compelling investment opportunity today. The article Is This the Best Stock in the Market Today? originally appeared on Fool.com. Motley Fool contributor Matt DiLallo has no position in any stocks mentioned. The Motley Fool owns shares of CF Industries Holdings. Try any of our Foolish newsletter services free for 30 days. We Fools may not all hold the same opinions, but we all believe that considering a diverse range of insights makes us better investors. The Motley Fool has a disclosure policy.